No matter what level of photography your skill is, every photographer needs a proper camera bag to store and protect their gear but worry not, lots of great functional but stylish camera bags are to be found without breaking the bank! The good thing about photography is there are new developments coming out, daily. There are so many options on the market now that deliver high-quality, cost-efficient, and functional products. Thanks to reviewing sites, underdog brands have really stepped up their game, delivering us great camera bags that now rival known and trusted brands, letting you spend more money on the good stuff! In this article, we are going to look at the most popular DSLR camera bag styles on the market right now. We’ll look at some brand names, popular camera bag styles and some important extras you should know about, like where to put your little extras for your new vlogging camera. NOTE: by CLICKING ON IMAGES AND RED BOXES WILL take you to that specific product on amazon to show THE PRICE AND CUSTOMER REVIEWS, if you purchase on amazon – we receive a small commission. 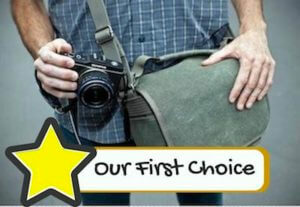 If price is one of your concerns, then turn to Evecase’s SLR/DSLR shoulder-strap camera bag. This bag isn’t meant to carry multiple DSLRs and lenses but if you are looking for a well-made bag for daily use with a single setup, this bag hits the perfect price point. 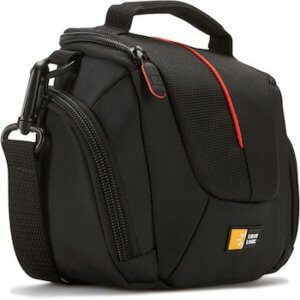 The Evecase DSLR shoulder bag is made from high-quality Nylon making it easy to clean and weather-resistant. 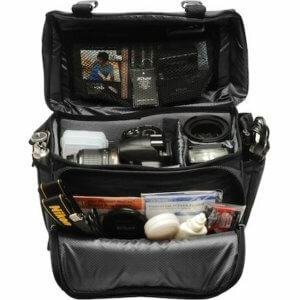 The main pocket is spacious and contains a few dividers to separate and protect your camera and accessories. The exterior of the pack has two large pockets to hold smaller personal items. Case Logic’s Compact Camera Bag fits almost any small kit setup. The thick polyester material ensures good weather protection and has handles, shoulder strap, and a belt loop offering mobile flexibility. The DCB-304’s exterior has rubberized zippers and heavily padded handles. The interior of the pack boasts a firm insert that has elastic attached to accommodate a variety of instruments. The outer two pockets add extra space for batteries, cords, cell phones and other small necessities. The top flap has a small zippered pocket for small stowaways. 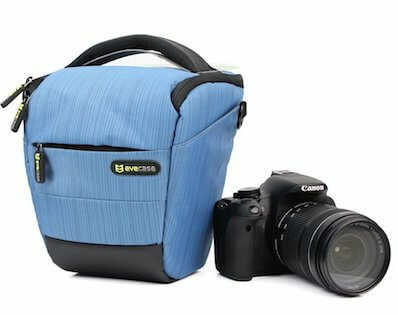 Packed with functionality for its value, Case Logic hits a home run with their DCB-304 compact camera bag. Lowepro’s Passport Sling DSLR camera bag packs a lot of gear for its compact design and it also a good choice for photographers on the move. The sling arm is adjustable and the shape is easy to shift around your body for quick access to your camera. Two exterior pockets to hold memory cards, cords, keys, cell phone and more. Thoughtfully the lowepro camera bag purse included is a water bottle holder. The interior of the Passport Sling can fit a DSLR camera with lens still attached which is good because it’s also expandable, giving you 30% more space is needed, so you can fit a second lens or flash. Basics brings it home again with their small-size sling camera bag. The ‘sling’ style makes this bag easy to maneuver from your back to front, making access to your goods, quick and hassle-free. The bottom of the bag has rubber feet to hold itself upright and clean when put down on the ground. The spacious interior features compartments that can fit one smaller SLR camera body, 1-2 lenses or flash. 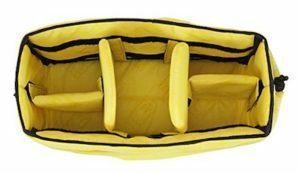 A great perk of this pack is that the compartments are adjustable, which means you can remove or reconfigure the inside pockets and flaps to fit your individual needs. On the exterior, you’ll find large pockets to hold cell phone, keys, battery pack, memory cards and cords and other small accessories. Believe it or not but our top pick for best camera bag for simple functions, is the Amazon Basics Backpack for SLR/DSLR, boasting over 5K reviews on Amazon, and for good reason. The ‘Basics’ Camera Backpack sports double-stitched, shoulder straps (chest strap included!) and an easy-to-clean Nylon exterior. Two pockets decorate the sides to hold small personal items like keys and cell phones and two large pockets to hold tablets, manuals or to stow away rain gear. There are two convenient side straps to hold a tripod or umbrella. The interior is lined to protect gear from scratches and also includes several adjustable inserts. Two large plastic zip pockets are great for batteries and memory cards. At such an affordable price, this backpack is hard to overlook. If you love to travel are looking for the perfect camera bag, Altura offers a DSLR, mirrorless backpack part of their “Light Traveler” series. 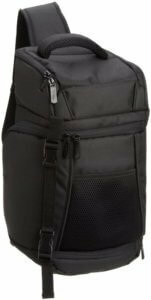 This compact backpack’s double stitching ensures longevity and the exterior, made of water-repellent Nylon, not a complete waterproof camera bag however it ensures durability. The capacity of this Altura model holds one DSLR camera with attached lens, plus space to hold up to four additional lenses. The interior is built with adjustable compartments to fit in flash and tripod. An interior slip can hold tablets up to 12 inches. Outside pockets fit extra accessories for cables, battery pack, and personal items. Another great perk about this DSLR/mirrorless camera bag is it is TSA-guideline compatible, with dual zippers that can come together using standard luggage locks. 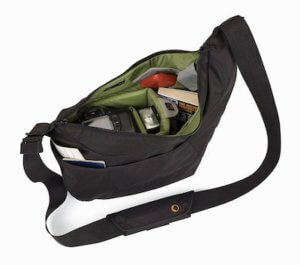 One brand rated high in efficiency for their canvas-style sling camera bag is BestTek. 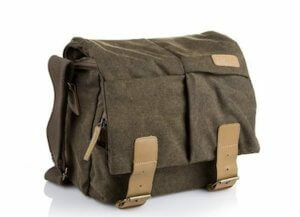 Their waterproof, canvas shoulder camera bag boasts excellent reviews both for looks and functionality. This pack can be adjusted to use as a shoulder bag or you can loosen the shoulder strap for a messenger camera bag style. The outside canvas has ben treated to withstand harsh weather, keeping your goods dry, inside. Dividers and adjustable flaps inside will help you to keep organized. The retro-style is modern but understated, making this bag perfect for everyday use. 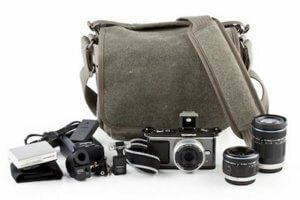 Think Tank designed us the perfect stylish camera bag with their Retrospective 5 shoulder camera bag. This stylish old-school bag can comfortably hold one DSLR and 3 lens options. Helps you blend in with the crowd and not draw attention to your expensive equipment, the silent opening, and closing system allows you to open your bag during filming. The interior has space for accessories like pens, cell phone, batteries, and tablets. This outer layer has been oiled slightly to withstand light weather conditions, but what’s great about this model is it comes with a sealed rain cover to protect your priorities from the elements. 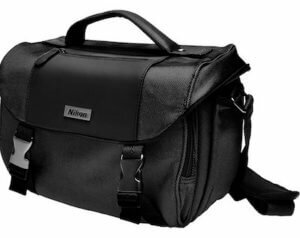 Nikon is a household name when is comes to vlogging equipment and they hit it home with their gadget camera bag. Made from durable Nylon, this bag comes water-resistant and heavily padded to offer protection even when you’re not looking. 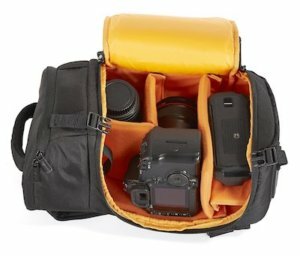 This Nikon camera bag’s interior measures at 28 x 17.8 x 12.7cm) can store one DSLR and has adjustable Velcro inserts that can be moved around to fit another 1-2 lenses or flash. Five additional zippered pockets can be found (two outside, one large zippered at the back, mesh pocket on the inside flap, and interior zippered pocket) decorating the bag making storing cords, battery packs and memory cards a simple endeavor. Nikon never fails to deliver quality products backed by experience. 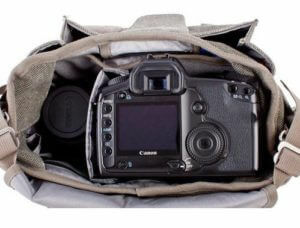 Canon is another trusted name in camera equipment and they don’t disappoint with their Canon Deluxe Gadget Bag 100EG. 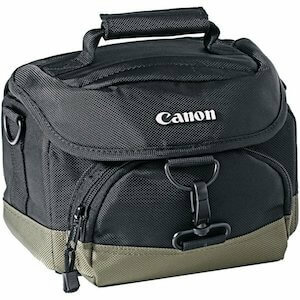 If you are serious shooter looking for something economical and a bit smaller in size than a backpack, check out the Deluxe Gadget Canon Camera Bag. It can fit up to one small DSLR plus one smaller lens, or two smaller mirrorless cameras with lenses. The interior comes with inserts that can be arranged to fit a charger, cords, or even a flash. This bag is very versatile. The front pocket is large enough to fit memory cards, cell phone, and lens caps. 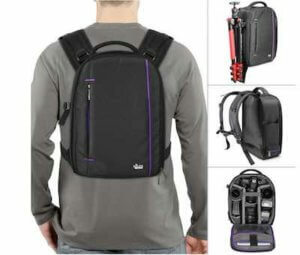 This small gadget camera bag also sports a belt loop and comes with adjustable shoulder strap. 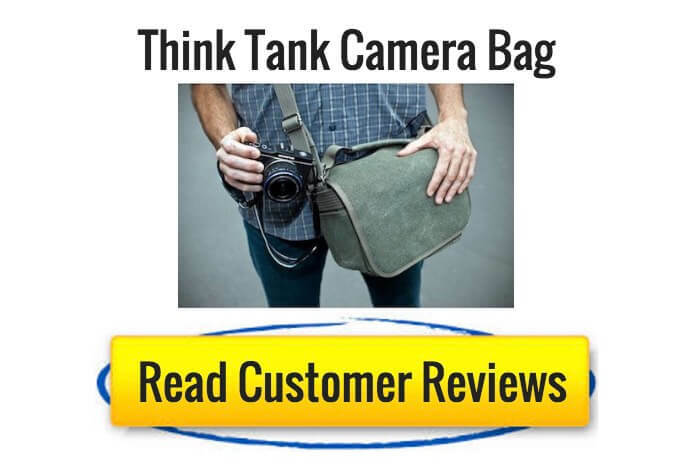 With over 1K reviews, this bag is priced well and offers a lot of functionality. When it comes to the best camera bag insert, look no further than Ape Case’s Cubeze. This flexible cube is sturdy enough to stand alone or can fit easily sit into another bag or case. There is room for one small DSLR, lens, and flash. but the padded interiors are completely adjustable, allowing you to fit just about anything if organized well. The cream color allowing you to locate things quickly in dim lighting. If you are looking for something a little more of a high-end camera bag and purses we will have that article for you soon.